After you finish taking Practice Exam 1 in Chapter 20, take some time to go through the answers and explanations in this chapter to find out which questions you missed and why. Even if you answered a question correctly, read the explanation that goes with it because I tuck in some additional information that’ll be useful on the real SAT. If you’re short on time, turn to the end of this chapter to find an abbreviated answer key. Note: To determine your score on this practice test, turn to the appendix. • Curiosity impels the great explorers. • Without curiosity there would be no scientific discoveries. Body paragraphs: Explore the supporting points, one in each paragraph. Mention a couple of explorers and their discoveries, and explain what would be lost to humanity if not for curiosity. Then go on to talk about research scientists who are driven by the need to know and how their work makes an impact on humanity. Again, use some specific examples. Concluding paragraph: State your conclusion: Curiosity drives the human race forward, but this quality is not without drawbacks. Nuclear arms, for example, would not have been developed if humans were satisfied with what was already known. Still, the rich knowledge of the universe and the benefits of modern medicine may be attributed to curiosity, so, overall, humanity benefits from this trait. Now that you have an idea how a well-organized essay for this test prompt might flow, it’s time to score your own essay. Before you get started, turn to Chapter 8 and read the samples there. Then score your essay using the scoring rubric in Chapter 7; be honest with yourself as you determine how your essay rates according to the standards in the rubric. 1. A. The clues are not and but, which set up a contrast. The best contrast to intellectual is practical. Theoretical (not concrete, existing only in thought) and philosophical (relating to a system of thought) are in the land of ideas, as is intellectual, so no contrast there. Ethical (moral) and strident (loud and unpleasant, like the guy who sits next to me at Yankees games) aren’t opposites of intellectual. Look for negative words that signal a change of direction in the sentence. 2. B. The clue in the sentence is than was previously thought. If you were to place your own word in the blank, you might choose new or current. Contemporary (occurring now) is the only answer that reflects the right time. Prior (earlier, happening before) and antiquated (old-fashioned) don’t make sense. Theoretical just doesn’t fit the context. 3. C. You can crack this sentence by considering the contrasting nature of the two ­elements — architectural history and engineering. A paper on engineering shouldn’t have architectural history in it, so those references would blur or weaken the focus. This concept takes you to Choice (C), where you find myriad (countless), which is the ­correct answer. Were you tempted by Choice (D)? Job references often use the term impeccable to describe job candidates — or, at least, you hope yours do! — but impeccable means ­“faultless” and doesn’t fit the meaning of the sentence. 4. A. Choice (B) may tempt you because, if grammar is everywhere, its presence — and your days of fun with nouns and verbs — may seem inevitable (unavoidable). But innate means “inborn” or “natural.” If every language has grammar, it probably comes from within. The sentence makes it clear that grammar can’t be extraneous (extra, unnecessary) or coincidental (just happens to be there). Multifaceted (many sided, versatile) could apply to grammar, but the sentence has no hook to attach that meaning. 5. E. The clue is the phrase once prosperous. The government is adding money to the economy (subsidize means “to pay part of the costs”) to reinvigorate (add life to) the area. Two bad but appealing choices are Choices (C) and (D). Enervate resembles energy, so you may have thought the word meant “energize.” However, it actually means “weaken.” Aggrandize means “to add power,” so it isn’t an impossible selection, but Choice (E) is still better. Stagnate (to grow stale, to remain without change) and annex (to make part of) aren’t even close. 6. B. The council is clearly insisting that global warming be the subject of Deeplock’s meeting. Adamant means “uncompromising” or “insistent.” Ambivalent (having mixed feelings), apathetic (not caring), and neutral (not taking a position) don’t fit. Perplexed may be an option because, if the council is confused, it may want to discuss the issue. However, Choice (B) is best because it matches the “won’t take no for an answer” tone of the sentence. 7. A. Zero in on notwithstanding, a nice mouthful that means “despite” or “in spite of.” The sentence tells you that despite some kind of effort, the team lost. The best choice has to have something to do with a great or really strong effort. Herculean — a word that is derived from the name of the Greek hero Hercules — fits the bill. Hercules was famous for being “great and strong,” which is what the adjective derived from his name now means. Spontaneous (spur of the moment, unplanned), gratuitous (needless, uncalled for), pluralistic (reflecting many viewpoints), and intermittent (stopping and starting at irregular intervals) don’t do the job. 8. A. Did Choice (B) fool you? The sentence has to do with history, so you may have been tempted by the resemblance between historiography and history. But historiography is the study of how history is written, not history itself. Because the sentence is referring to history,dissertation (a scholarly paper) is appropriate. A memoir is made up of personal reminiscences. Polemic (a bitter argument, especially about religion) and diatribe (a verbal attack) have intense meanings, and the sentence seeks the opposite. 9. A. The questions in the middle of the paragraph provide the key to the actual answer to this question. If you ask who should make a decision, you imply that more than one possible path to a decision exists. Hence, Choice (A) is a good option. Choice (B) is out because nothing in the passage separates mission and strategy. Choice (C) is wrong because it’s the opposite of Choice (A) and thus the opposite of what the passage implies. Strategic planning is useful, as are some (albeit unbelievably boring) texts that teach this discipline, so Choice (D) is out of the running, too. In my ideal world, Choice (E) would be the correct answer because then even my lowly level (a teacher) would have a role in decision making; however, the passage doesn’t clearly imply the statement presented in this choice, so (E) is wrong. 10. C. Sentence 1, which deals with the source of significant power, is the crucial part here. Goals is another word for mission and methods is another word for strategy, so Choice (C) is basically a reworded Sentence 1 — and the correct answer. 11. C. According to the passage, Justinian made efforts but could salvage only the appearance, not the substance, of the Empire. So what kind of efforts did he make? Check out the last sentence of the passage: In Western Europe, new forms of social and governmental activity evolved. The key word here is new; thus, Justinian must have been trying to keep the old forms, without success. Choice (C) wins the prize. 12. B. In normal everyday English, a trap is something that catches you, so you may have zeroed in on Choice (A) when you first read this question. Bad idea. In the context of the passage, the word trappings refers to appearance, especially ornamental details — not substance. Vocabulary-in-context questions like Question 12 often include a common meaning of the vocabulary word in their answer choices. Be careful when reading these questions and the passages that go with them; make sure you choose the meaning of the word that goes with the passage’s context. 13. E. The first sentence states that attempts to define feudalism are “far from being closely related to one another,” so disagreement exists. You can rule out Choice (A) because the paragraph states that feudalism came into existence in France. The paragraph contains no information about feudalism’s spreading from England to Spain, the concept that Choice (B) states. The passage uses a form of the word controversial to describe the labeling of Egypt and India as feudal. Because controversial means “not generally agreed upon,” Choice (C) is wrong. Finally, Choice (D) is a dud because the author does define feudalism, which, therefore, isn’t impossible to define. 14. A. Lines 10–14 state that “countries that came under their influence . . . possessed feudal attributes.” Choice (A) is the only answer that refers to that influence. 15. B. The author provides only one detail about Russia — that it had a system very close to vassalage. Thus, you can dump Choices (A) and (D) right away. Choice (E) also bites the dust because the 16th century is fairly far from modern, as Shakespeare’s sometimes-impossible vocabulary shows. Both Choices (B) and (C) are possible answers, but you need more information to contrast Russia and Japan, so Choice (B) is the best answer. 16. D. The easy definition of vassal — a knight — isn’t an option, so you have to look for something that means the same thing as knight. The passage makes clear that vassals traded military service and other obligations for land and other rights, such as protection of widows and children, so Choice (D) is correct. 17. A. The passage details how land is transferred (Lines 25–29 and 52) but mentions no other economy, so inferring that land was the basis of wealth — the statement in Choice (A) — is a safe bet. Little evidence in the passage supports Choices (B) and (C), and the passage directly contradicts Choices (D) and (E). 18. B. The castle had to be garrisoned (Lines 37–38), that is, staffed by soldiers (not erected by ­soldiers). The passage says nothing about the people who had to carve and carry all the stones that eventually became the castle. The other choices are all mentioned in the passage as obligations that vassals owed their feudal lords. 19. D. As soon as you read this question, you can rule out Choice (B) because the peasants don’t play a role in the passage, although in real life they did do all the work. Choice (E) is also wrong because the lord gives permission for marriage but doesn’t do matchmaking duty. The other three choices concern advice; the crucial sentence that helps you decide which one is right appears in Lines 38–39. One of the lord’s advantages in the lord-vassal relationship was receiving counsel from his vassals. Therefore, Choice (D) is the right one. Forced advice (A) isn’t an advantage (imagine your mom advising you to do your homework), and the passage says nothing about lords seeking advice from their peers, an idea contained in Choice (C). 20. D. Choice (A) is appealing at first glance because Lines 80–82 talk about instability. However, Choice (D) is better because the instability is linked to the absence of a strong ruler (sort of like a game of dodgeball when the ref ducks out for a cup of coffee). The passage doesn’t support Choices (B), (C), or (E). 21. E. A pyramid is narrow at the top and gradually widens as you move toward the base. In the analogy, the king is the top of the pyramid, but those under him (the vassals) are ranked from highest (just under the king) to lowest (the base). Choice (E) is the correct answer. 22. E. This question forces you to figure out which word or idea the pronoun this replaces. Your clue is the end of the sentence, which mentions the positive results of feudalism, which balances this. Okay, the balance of something positive is something negative. Because this follows a whole list of negatives, you can safely conclude that the whole list is tucked into that one word, making Choice (E) the right answer. 23. B. Nominal comes from the root word for “name.” As the passage makes clear, plenty of in-fighting disturbed the political and economic order. But the passage also states that feudalism supported some measure of territorial organization. Bingo, Choice (B) is your answer. 25. B. Okay, I confess that I like Choice (E), but the pyramid is just one analogy. It isn’t enough to carry the whole piece. Choices (A), (C), and (D) are good for parts of the passage, but the more general Choice (B) is the best answer. 1. D. If you add the numbers in the ratio, you get 7. There are 28 total students, which is 7 × 4. Therefore, multiply the original ratio numbers by 4 to get 12 boys and 16 girls. You can ­double-check your work by doing this equation: 12 + 16 = 28. 2. D. Plugging in the number gives you 2(–2)4. Remembering the acronym PEMDAS (see Chapter 12 if you don’t remember), you know to do the exponent first: (–2)4 = (–2)(–2)(–2)(–2) = +16; 2(16) = 32. 3. A. The drawer contained 22 pairs of socks originally. However, Josh has thrown 4 pairs on the floor, so he now has 18 pairs to choose from, 6 of which are brown. His probability of success is therefore 6⁄18 = 1⁄3. 4. C. This question is the first of many appearances of the 30-60-90 triangle on these practice exams. In this type of triangle, the length of the hypotenuse is always twice the length of the shorter leg, while the longer leg’s length equals the shorter leg’s length times . Because you know the shorter leg equals 5, you know that the longer leg is , and so the coordinates are . 5. B. 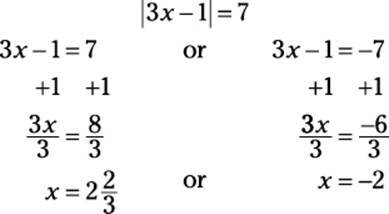 This question isn’t too bad as long as you remember your exponent rules. (Check out Chapter 14 if you need a refresher.) By definition, 40 = 1, and 641⁄2 is the square root of 64, which equals 8. So the expression in parentheses equals 1 + 8 = 9; 9–2 means the reciprocal of 92 (or 81), so the answer is 1⁄81. 6. D. Don’t let this one fool you. Thinking that the girls have $24 combined is tempting, but that’s not what the problem says. To do this problem, you need to find two numbers in the ratio 7:5 that have a difference of 24. You can work this problem a couple of ways. One is to use algebra: You can call Dora’s money 7x and Lisa’s money 5x. Then you can say that 7x = 5x + 24, or 7x – 5x = 24. Thus, 2x = 24, and x = 12. Plugging 12 back into the original equation (always an important step) tells you that Lisa’s money is 5(12) = $60, and Dora’s is 7(12) = $84. The other way to solve this problem is to subtract the numbers in the ratio instead of adding them. Because 7 – 5 = 2, and 2 goes into 24 12 times, you can multiply the original ratio numbers by 12, giving you the same answers you get using algebra. The perimeter, 34, is the sum of all the sides, so (x) + (x + 3) + (2x – 5) = 34. Combining the like terms on the left side gives you 4x – 2 = 34. Adding two to each side gives you 4x = 36, which leaves you with x = 9. Now you need to plug 9 into the original equations: The first side is 9 cm, the second is 9 + 3 = 12 cm, and the third is 2(9) – 5 = 13 cm. Because this third side is the longest, 13 cm is the answer. 8. B. You can draw the line and count spaces to determine that the points are 12 units apart, or you can simply subtract: 8 – (–4) = 12. (Distance always involves a difference.) 1⁄4 of 12 is 3, so you need to find the point 3 units to the right of –4; –4 + 3 = –1. 10. C. On the real SAT, try all the numbers by plugging them in; doing so is usually faster than working out the problem. I do it the long way here, though, so you can practice your algebra skills. Start by cross-multiplying to get (x – 1)(x + 2) = (x + 7)(x – 2). Now you can use FOIL (a technique I explain in Chapter 14) to get x2 + 2x – 1x – 2 = x2 – 2x + 7x – 14. Simplifying each side, you get x2 + x – 2 = x2 + 5x – 14. A neat thing happens when you start to combine the like terms on different sides. You can subtract x2 from both sides, which means that both x2terms just disappear, leaving you with the simple linear equation x – 2 = 5x – 14. Subtracting x from both sides yields –2 = 4x – 14. Now you add 14 to each side to get 12 = 4x, and x = 3. 11. B. Because 15 is composite (it’s 3 × 5), &15 = 2(15) = 30. 9 is also composite, so &9 = 2(9) = 18. 36 is composite, too, and &36 = 2(36) = 72. Only option II works, so Choice (B) is the correct answer. A prime number is divisible only by itself and 1. A composite number is anything that isn’t prime or special. (Zero and one are considered “special” numbers.) Turn to Chapter 12 for more information on these types of numbers. 12. C. Direct variation problems require a ratio — in this case, the ratio of volume to temperature. Thus, you can write . Cross-multiply to get 210x = 9,450 and divide by 210 to get x = 45. 14. E. To be honest, you don’t even need to know what x and y equal in this problem. 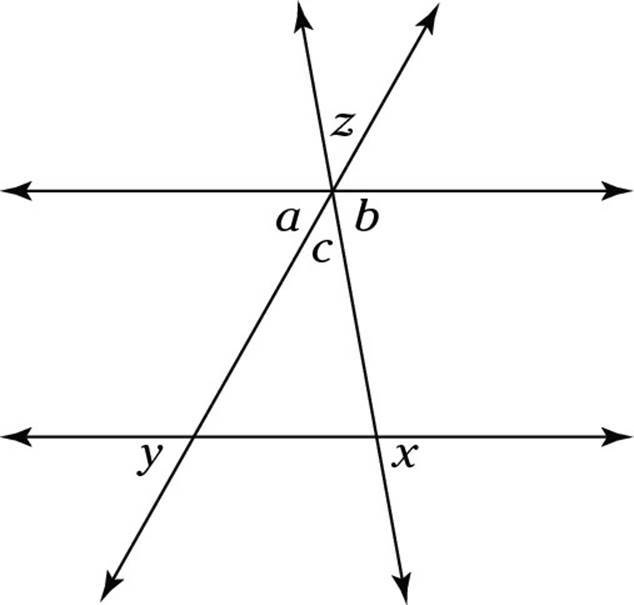 Look at the angle marked c in the diagram below (not drawn to scale). Angles c and z are vertical angles, which means that their measures are equal. Also, angles a, c, and b form a straight line, so a +c + b = 180°. Therefore, a + b + z = 180°. By the way, you can also figure out the actual angle measurements if you want to: a = 30°, b = 70°, and z = 80°. 15. B. Although there are 18 terms between 7 and 159, the increment must be applied 19 times. Because 159 – 7 = 152, and 152 ÷ 19 = 8, each term must be 8 units greater than the one before it. So the sequence begins 7, 15, 23, 31 . . . (and you have your answer). 17. A. 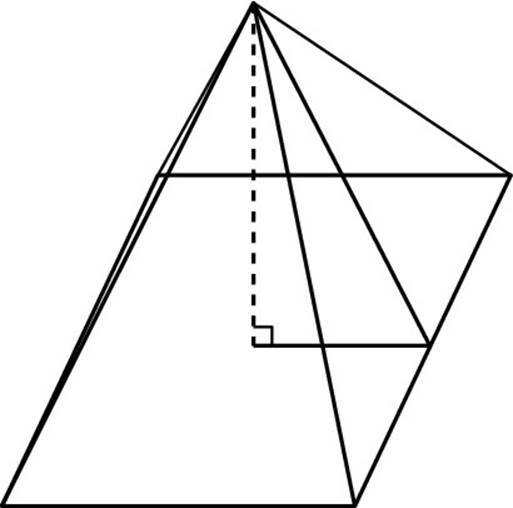 To answer this question, you must first realize that the triangles here are special; break up the 75° angle at the bottom right into a 45° angle and a 30° angle. The top right triangle is a 45-45-90 triangle, which makes both of its legs equal to 14. The bottom leg is also the hypotenuse of the 30-60-90 triangle at the bottom. In a 30-60-90 triangle, the hypotenuse must be twice the shortest leg, which is j. Therefore, j equals 7. Don’t remember the special triangle ratios you need to know for this problem? Well, don’t panic. They’re at the top of each mathematics section of the SAT, so take a quick peek at the directions at the beginning of the section to refresh your memory. 18. C. You can solve this problem using simple arithmetic. If you add up the 65 Spanish students and the 32 art students, you get a total of 97 students. However, you counted the 14 students who take both subjects twice, so you need to subtract 14, giving you 83 students in either Spanish or art. (This method always works to find the total number of things in two groups combined: Add up the number in each group, and then subtract the overlap.) If 83 students are in Spanish and/or art, you’re left with 100 – 83 = 17 who don’t take either subject. 19. D. Because the answer should be in minutes, start by turning 3 hours into 180 minutes. You know that k percent of these 180 minutes is going to be used for math. What does k percent mean? Why, it means k⁄100. Taking a percent of a number involves multiplication, so your answer is 180 × k⁄100, or 180k⁄100. 20. A. ABD is a right triangle, so you can find BD using the Pythagorean Theorem: (4)2 + (8)2 = c2; 16 + 64 = c2; 80 = c2; so c = . Because DE = , the area of BDEF is . Now, the shaded region’s area is the area of the rectangle BDEFminus the area of the triangle CBD, and the area of CBD equals 1⁄2 × base × height = 1⁄2 × 8 × 4 = 16. Thus, the area of the shaded region is 40 – 16 = 24. 1. D. The word yet signals a change in direction for the sentence — a contrast between admired and something else. Choice (D) is the only option that opposes admired. Choices (B), (C), and (E) are synonyms of admired. And if the strangers are reading about Elwood, they aren’t ignoring him, which makes Choice (A) wrong. 2. A. The whole sentence revolves around the word despite. The ambassadors have made an assumption that is challenged, but not overturned, by the word in the blank. Resistance works well here. Choices (B), (C), and (D) don’t challenge the ambassadors’ views (withdrawal means “pulling out” and compromise means “giving in a bit”). Interrogation (questioning) is in another vocabulary universe entirely. 4. B. SAT questions don’t rely on historical knowledge, but if you know anything about segregation and the courts, you have a leg up on this question. Segregation isn’t legal, so you can immediately drop Choices (A), (C), and (E), which allow the practice. When you check out Choices (B) and (D), you see that persist (continue) easily beats out intimidate (threaten). 5. E. The most important clue here is the word hide. If Jane Austen is hiding her manuscript, publicize and reveal are definitely out, so you can eliminate Choices (A) and (B). Check out the three remaining possibilities: alert and conceal go together nicely. Don’t stop when you find a word that fits the first blank in the sentence. Always check both blanks. Otherwise, you may overlook the better answer (and get the wrong answer). 6. D. Although is the word to watch here. Check out the first half of the sentence. In general, what are juries trying to achieve? A vote of 12 to 0 on a verdict, right? So the first blank may be filled by Choices (A), (B), or (D) because all imply agreement. The although signals that the second blank is a bit of a surprise, so amity (friendship) is better than discord (disagreement, which you already know) and anger (which you may expect when people have differing views). 7. D. To answer this question, you need to focus on two important spots in the sentence: not . . . but. This pair of words tells you that you’re looking for the opposite of one disease. Still in the running at this point are Choices (B), (C), (D), and (E). Now send your eyeball to the end of the sentence, which gives you two very different details — solid tumors and proliferation (rapid growth) of white blood cells. With this info in mind, you can determine that the best choice is diverse, so Choice (D) is correct. 8. D. This question is a particularly difficult one. Filling in the blanks with your own words may lead you to happy and sad, given that the word but signals a contrast. Choices (A) and (B) start you off with happy words and then let you down as far as sad goes, because affable means “friendly” and mirthful means “full of laughter.” Choices (C) and (E) also bite the dust because no one expects a lottery winner to be depressed or acrimonious (bitter). But you may think a shy person would be intimidated (threatened) by wealth and surprised to see her confident, so Choice (D) is your answer. 9. B. The second half of the sentence holds the key: The items are of various ages and from lots of countries. Eclectic (from different sources) plops into the sentence nicely. The ­question-writer (okay, me, but I’m just doing what those tricksters at the SAT will do to you) has tucked in Choices (D) and (E), two church references, to distract you. Choice (C), international, makes sense with the many . . . nations part of the sentence but ignores periods, so it’s wrong. Ubiquitous (appearing everywhere) doesn’t work at all. 10. E. Paragraph 1 makes it clear that Mariga carves all the time, and because of his family background and talents, he’s open to artistic possibilities. By explaining these background facts, the author paves the way (Get it? The passage is about stone!) for the discovery of soapstone as a carving material. 11. C. You can rule out Choices (A), (B), and (E) because they contradict information in the passage. Mariga’s trips were easier after the road crew did their work, and the journey was clearly not impossible because he made it. Nor did Mariga travel for artistic purposes; he was sent by the Ministry of Agriculture. Choice (D) is a good (but wrong) answer because Paragraph 1 tells you that he would be carving no matter where he was, because carving was his passion. The best answer is Choice (C) because the paragraph clearly sets up a cause-and-effect relationship; Mariga bumps along and sympathizes with the farmers who have to get their crops over the nonexistent roads. 13. D. The last paragraph of Passage I changes focus from Mariga’s obsession with soapstone to a small industry based on the creation of soapstone carvings. The author doesn’t explain how those two are related, but the passage strongly implies that Mariga was at least partly responsible. Also, the first paragraph of Passage I presents Mariga as a teacher who couldn’t resist showing his friends, Titus and Robert, how to carve. The only other enticing (tempting) choices are (C) and (E) because Mariga probably had more fun carving than farming. Nonetheless, the passage more strongly supports Choice (D), so it’s the best answer. 14. C. Line 59 explains that the soapstone carvings were “exhibited all over the world.” The author clearly admires the artwork, so Choice (C) is the correct answer. 15. D. The passage describes the crisis in Africa that has limited educational growth (war, funding, and so on) and also states that “something must be done quickly to reverse the trend” (Lines 100–101). The implication is that if the situation isn’t changed now, it may never be. 16. A. You can’t run a computer without software because the software is the “brain” telling the computer what to do. The same thing goes for voters. If the voters aren’t educated, they can’t choose good, effective leaders who will make a positive difference during their time in office. 17. D. The author doesn’t say anything about traditional ways, but each of the other choices pops up somewhere in Passage II, so Choice (D) is the one you want here. 18. E. Investment in primary education differentiates Southeast Asia from Africa. The whole passage describes the problems of African education, so you can safely bet that Africa invests less, not more, in primary education. 19. B. John Nkoma doesn’t want Africa to be the exception to the rule of technological development stemming from basic science. Basic science is a short hop (just a skip, really) from good education. 20. C. The SAT writers describe the economies of Southeast Asia in a positive way, so you can feel confident going with Choice (C). 21. B. The passage ends with the idea that governments can’t do it all, especially the weak governments that exist in some parts of Africa, so Choice (B) is the next logical statement. 22. B. The first passage deals with the discovery and marketing of soapstone carvings, concentrating on the role of one man. The second discusses the need for government investment in education, which is described as only part of the solution, with community action being essential as well. 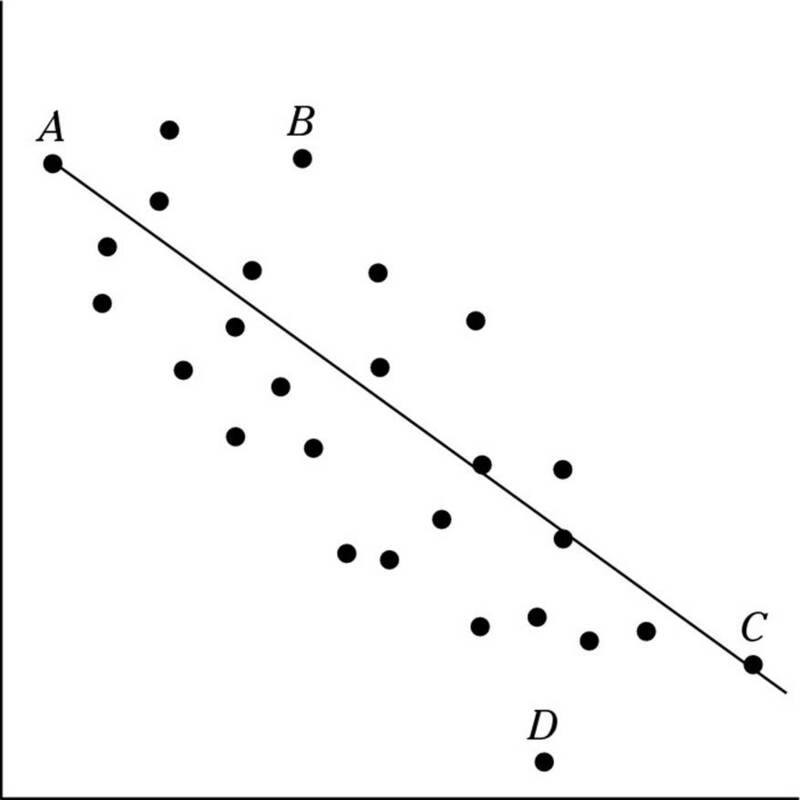 Choice (B) illustrates this change in attitude. 23. E. A couple of these choices lose only by a nose because although they fit most of the material in these two passages, they don’t fit everything. The key is to look for the best answer. Hardships — Choice (A) — occur in the hilly country of Passage I and are implied by the lack of education in Passage II, but neither passage focuses on that aspect of African life. Choices (B) and (C) fit well with Passage II but not Passage I. Choice (D) is a poor fit all around. Choice (E) is the best answer because the development of the art market dominates Passage I, and Passage II links education to African economic development. 24. A. Passage I tells a story of one specific individual and his experience. Passage II contains broader, more general statements about education, the economy, and technology. The distance you’re interested in is the dotted line. Hey, wait a minute: This diagram is a triangle! Therefore, you can use the triangle inequality, which tells you that the sum of any two sides of a triangle must be greater than the third side. The number 10 doesn’t satisfy the inequality because 10 + 13 = 23, which is less than 24, so you have your answer. 2. C. If you multiply each of the choices by 3 points, you get 30, 33, 36, 39, and 42. Because all the other scores are worth 5 points, you must be able to add a multiple of 5 to one of these numbers to get 61. The only one that works is 36 because 36 + 25 = 61. 3. C. Don’t fall into the trap of thinking that 1 is prime. Two numbers, 1 and 0, are called ­“special.” Thus, 2 isn’t a tweener because 2 – 1 = 1 and 1 isn’t prime. The number 8 isn’t a tweener, because 8 + 1 = 9 and 9 isn’t prime, either. (It’s 3 × 3.) But 30 is a tweener because 30 – 1 = 29, which is prime, and 30 + 1 = 31, which is also prime. After you’ve found the answer, you can move on to the next question; there’s no need to check the last two options, which are wrong. 4. A. Don’t fall for the old “less than” trick. “Twelve less than something” is the thing minus 12 — not the other way around. So you want an expression that says “x squared is 5 times x minus 12,” and (A) is the winner. 5. B. Five pounds of peanuts times $5.50 is $27.50, and two pounds of cashews times $12.50 is $25.00, so the total cost is $52.50 for seven pounds. $52.50 divided by 7 is $7.50. 9. 96. This problem is simple if you remember an easy trick: total = number × average. In this case, the total must equal 4 × 90 = 360. Adding up Lauren’s first three scores gives you 264, and 360 – 264 = 96. Another good way to solve this problem is to play the over/under game. For each score, figure out how much it is over or under the average. In this case, you get –1, –5, and 0. Adding up these numbers gives you –6, so Lauren is 6 points under average before she takes her last exam. Thus, she needs 6 points over her average, or a 96, on the last exam. is 14?” You can use the is/of method to solve this problem: . The is/of method relies on this formula: . See Chapter 12 for more information. 11. 11. In a radical or absolute-value problem, you first need to isolate the radical or absolute value. Therefore, you have to subtract 1 from both sides of the given equation before doing anything else; doing so gives you this equation: . Now you can square both sides to eliminate the radical: 4x – 8 = 36. Adding 8 and dividing by 4 gives you your answer, x = 11.
question says this equation equals 21, write . By cross-multiplying (you can put 21 over 1 if it helps), you get 7p = 21(p – 4) or 7p = 21p – 84. Subtracting 21p from both sides gives you (–14)p = –84, and dividing both sides by –14 yields p = 6. Double-check your answer by doing the following: 6\\7 = (6)(7)/(6 – 4) = 42⁄2 = 21. Don’t fall into the trap of writing 2x + 5x = 84; a rectangle has four sides, not two. Write either 2x + 5x + 2x + 5x = 84 or 2(2x + 5x) = 84. Either way, the left side is 14x, so 14x = 84, and x = 6. Another trap lurks here: 6 isn’t the answer. 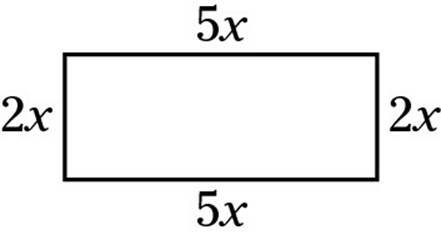 You represented the width with 2x in your original equation, so the width is 2(6) = 12 feet. 14. 520. A linear function has the form y = mx + b. In this problem, x is the number of people, while y is the cost. You can choose from several ways to work out this problem, but here I focus on the slope, which is the change in y divided by the change in x. When the number of people increases by 2, the cost increases by $50. Therefore, the slope m = 50⁄2 = 25. Now, because a party for 10 costs $320, a party of 18 adds 8 people, for 8 × $25 = $200 more. So a party of 18 costs $520. 15. 6. Although you can use trial and error to answer this question, I use algebra here to give you a little more practice. Darren makes $9 an hour on weekdays, and 11⁄2 × $9 = $13.50 on weekends. If you let d equal his weekday hours and e equal his weekend hours, you know that $9(d) + $13.50(e) = $189.00. You also know that d + e = 18 (his total hours), so you can solve this problem using substitution: d = 18 – e, so $9(18 – e) + $13.50e = $189. Distributing: $162 – $9e + $13.50e= $189. Combining like terms, you get $162 + $4.50e= $189. Now just subtract 162 from both sides and divide by 4.50, to get e = 6. Simple, right? Because this is a radical equation, square both sides, so 100 = 36 + (p + 1)2. Subtract 36 from both sides to get 64 = (p + 1)2. The easiest way to solve this problem is to think about squares. If a quantity (in this case, p + 1) squared is 64, then the quantity must equal 8 or –8. But the question tells you that p is positive, so p + 1 = 8, and p = 7. 17. 84. You can try to figure out what a and b equal, but doing so isn’t worth the energy. The key to getting this question right is remembering the formulas that I discuss in Chapter 14 — specifically, the one that says that (a – b)2 = a2 – 2ab + b2. Do you see how this helps? You know that (a – b) = 8, so (a – b)2 = a2 – 2ab + b2 = 64. This question asks you for a2 + b2, which is (a2– 2ab + b2) + 2ab, or 64 + 2(10) = 84. Pat yourself on the back if you got this one right; I think it’s the hardest problem in this section. 18. 360. The total surface area is the sum of the area of the square and the area of the four triangles. The area of the square is easy to find: It’s simply 10 × 10 = 100. The triangles are a little tougher. They don’t have a height of 12 because 12 is the height of the pyramid, but the triangles are slanted. 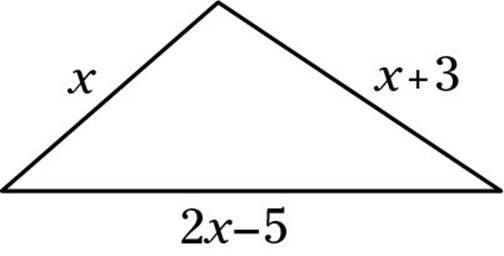 However, if you look at the following diagram, you see that you can find the height of the slanted triangles by using the Pythagorean Theorem. The little triangle in the diagram is a right triangle. One leg is 12 (the height of the pyramid). The second leg is half the width of the square, or 5. This triangle is actually the world’s second-most famous right triangle, the 5-12-13 triangle. (If you didn’t remember this little tidbit, you could’ve figured it out with the Pythagorean Theorem.) The hypotenuse, 13, is the altitude of each of the tilted triangles that make up the sides of the pyramid. Because the triangle’s area is 1⁄2 × base × height, each triangle’s area is 1⁄2 × 10 × 13 = 65. The four triangles together have an area of 4 × 65 = 260. Adding in the 100 from the base gives you 360, which is the answer. 1. B. Got a match? No, I’m not talking about smoking or lighting a fire. I’m talking about playing, studying, and to audition, all of which should, but don’t, match in structure. (In other words, they should be parallel.) Change to audition to for auditioning. Do you hear how the sentence sounds more balanced now? 2. C. Choice (A) is no good because you have two sentences joined by a comma — a big no-no. Choice (B) is overkill: You don’t need a semicolon and a joining word (and). Choice (D) drops out because the verb tense is wrong, and Choice (E) makes no sense. Thus, the correct answer is Choice (C). 3. B. The SAT writers are testing two different punctuation marks in this question: the apostrophe and the comma. You don’t need an apostrophe because the possessive pronoun (its) never has one. You do need a comma because when you glue two sentences together with a joining word (but in this sentence) you must place a comma before the joining word. 4. E. The guides aren’t objecting to him, just to the trespassing. To place the emphasis on ­trespassing, change the him to his. 6. C. This sentence connects the present to the past. The verb has traveled (present-perfect tense for you grammar buffs who just have to know) connects those two time periods. 7. D. The rule for introductory verb forms is that the next person or thing in the sentence has to be doing the action of the verb. In this sentence, the taxi can’t speed and wait at the same time, so the toddler has to be waiting. Thus, you can rule out Choice (A) immediately. Other choices drop away because of misplaced descriptions. Choice (B) is out because the hand is waiting. Choice (C) hits the mat because the taxi is holding hands, and Choice (E) has an unnecessary comma. Whenever you see a sentence on the SAT beginning with a verb form, watch out! The SAT makers love to mix up who’s doing what in the sentence to make sure you’re paying attention. 8. A. The rubber bone isn’t the only toy sold; it’s one of a group of toys. The toys in the group are sold, so you can rule out Choices (C) and (D). Which usually comes after a comma, and that is generally used without a comma. These two facts allow you to drop Choices (B) and (E). 9. B. The reason is that is correct; the reason is because is never right. Only Choices (B) and (E) use that, but Choice (E) has the wrong verb tense. 10. D. The missing word in this sentence is can, as in “why Olivia doesn’t write as well as he can.” After you add the missing word, you’re more likely to hear the correct answer because him can sounds strange. The grammar rule behind this question is that he may act as a subject of the verb can. The pronoun him is for objects only. 11. E. However can’t join sentences by itself; it must be accompanied by a semicolon. Both Choices (B) and (E) have semicolons, but Choice (B) adds a had, changing the verb to past-perfect tense, which you need only when you’re placing one event in the past prior to (before) another. 12. C. The subjects and verbs pair up this way: she thought, whoever/whomever would eat. The pronoun whoever is for subjects and whomever is for objects. In this sentence, therefore, you need whoever. Choice (C) beats out Choice (D) because of verb tense. 13. E. Although you may really hate verb tense, the rule on had is simple: The helping verb had places an action further in the past than the straight, unadorned past tense. So you have a supermarket being torn down and replaced by a gas station. The supermarket is further in the past, so it gets the had, or more specifically, the had been. Be sure you understand the sequence of events when checking verb tense. 14. D. With neither/nor sentences (and also either/or), match the verb to the closest subject. Students takes a plural verb, so you need were in this sentence. Choice (B) has the correct verb, but it adds an unnecessary they would, so Choice (D) is correct. 15. C. The it of Choices (A) and (E) is unnecessary, as is the article in Choice (B). (Also, articles don’t “say” anything because articles can’t speak.) Choice (D) has an extra comma. 16. A. Sometimes the hardest questions are the ones that are correct as they are. The original sentence pairs a plural pronoun (who, which refers to the plural noun researchers) with a plural verb (were). A-okay for this one! 17. B. The word although fits the meaning of the sentence better than and because although introduces a condition, which, in this sentence, is the fact that one country had two different languages and traditions. The other choices introduce unnecessary words. 18. C. The word so may join one idea to another in the sentence in a cause-and-effect relationship. Were you fooled by Choice (D)? The pronoun which may substitute for a noun or pronoun, but not for an entire subject/verb expression. 19. C. The key here is everyone, a singular word that must be paired with another singular word or phrase, such as his or her, but definitely not with the plural word their. 20. A. Costliest compares one thing to everything else. Costlier compares two things. In general, use -er comparisons between two things and -est for larger groups. 21. E. The answer to this question is No error. Did I trip you up with Choice (D)? Perhaps the apostrophe surprised you because apostrophes are usually associated with missing letters or with possession. But whenever you’re talking about time and money, you may find an apostrophe, as in an hour’s homework or two weeks’ pay. 22. B. Janine isn’t going to do two separate things — try and determine. She will try to determine. 23. D. If the padding nearly prevents, it doesn’t prevent at all. If it prevents nearly every wound, one or two stabs slip through. Thus, for the sentence to make sense, the nearly has to be moved. 24. D. If it’s his team, Archie is on it, so he should do better than anyone else on his team. 25. C. Consequently looks like a word that’s strong enough to join two sentences, but it’s actually a weakling. To join the sentences, you need to add a semicolon before consequently. 26. B. The along with is just camouflage; the real subject of this sentence is one. The verb must match the subject, so are needs to change to is. 27. A. Who is for subjects and whom is for objects. In this sentence, whom is the object of should bill. Think of the sentence as he should bill whom, and the answer becomes obvious. 28. B. Who didn’t care — Marisa or her aunt? No one knows (at least not from reading this sentence). The pronoun she must be clarified. 29. E. The SAT often includes sentences that contain this kind of construction: “the only one of the _____ who (or that or which) _____.” In this sort of sentence, the pronoun who or that or which refers to the one and, therefore, is singular and requires a singular verb. If you picked Choice (B) as the error, you fell into the trap because the verb was is singular and totally correct. 30. D. In an argumentative essay like the one presented in this test, the more detail you include to support your points, the better. Choice (D) provides the name of the network and delivers the remaining facts concisely and clearly and, thus, improves the original sentence. 31. B. A useful technique in essay writing — one you may use when you write your own SAT essay — is called concession and reply. With this technique, you anticipate the reader’s objections to your argument and answer those objections in advance. The second paragraph of the essay presents some of the arguments in favor of broadcasting trials and responds to those arguments. 32. E. Tucking the information about hotel stays into the first sentence is effective. Clauses beginning with that are seldom set off by commas. 33. B. Sentence 9 in its original version is wordy and contains two grammatical errors — ­dramatic instead of dramatically and a vague pronoun (it). Choice (B) is clearer and shorter. 34. C. When starting a new paragraph, look for a transition — a word or phrase that shows the reader the logical connection between the two paragraphs. Choices (C) and (D) are the only two with transitions, but Choice (D) introduces a completely irrelevant you. 35. D. The writer takes pains to explain that each case is different, so Choices (A) and (B) are definitely wrong. Choice (C) is too broad. Choice (E) is tempting, but the writer hasn’t provided evidence to back up the idea that only the judge can decide. 1. A. The structure of the sentence points you toward a word that contrasts with powerful. Yes, genes are powerful, but they’re not _____. (Fill in the blank with something else.) Choice (A), omnipotent (all powerful), creates the contrast you’re looking for. The only other possibility is Choice (D), but coercive (forcing, like a bully after your lunch money) is too strong here. 2. E. Dump the mailed paper statement, and what do you achieve? A reduction in litter and waste — the first words in Choices (D) and (E). Now check the second possibility. You don’t have admittance to a Web site; you have access. There you have it: Choice (E) is the answer you’re looking for. 3. D. Several answers are possible, namely Choices (B), (D), and (E), but the best one is Choice (E) because prolific (productive) best matches the one-book-a-year statement. 5. C. The first thing that should catch your attention in this sentence is only a tiny locker. Okay, that phrase rules out any choices referring to large size, including Choices (A), (B), (D), and (E), all of which refer to the opposite of small. What’s left? Choice (C), which begins with an antonym of large — cramped. 7. D. This one is tricky. Choices (A), (B), (C), and (E) all deal with food or drink, but the author is talking about motivation. Fuel comes closest in the sense that you fuel or power discovery and wonder. 8. D. If the researcher must make an adjustment to biostatistics, he or she is the wave of the future. The researcher may be critical, nostalgic, fearful, or adverse (all wrong answers), but the author is favorable. 9. B. Medical researchers have to know statistics — no matter how much that subject makes them tear out their hair — as the last two sentences of the passage make clear. 10. A. Passage II doesn’t mention passion at all, but Passage I’s narrator (the mad scientist who creates the “monster,” by the way) says that he is into his work heart and soul. Choice (B) is a trap because the first passage is from a novel but isn’t about literature at all. Choices (C) and (D) are also wrong because the first passage doesn’t give any evidence either way. Both passages mention education, so Choice (E) is incorrect as well. 11. B. The passage begins with Austen’s trademark irony. No one would think of Catherine as a heroine because her parents are alive, they have enough money, and they’re sensible people. To answer the question, then, you need to figure out how Catherine differs from a heroine, a situation covered by Choice (B). 12. A. Her father was “a very respectable man, though his name was Richard,” so you can infer that men named Richard aren’t generally respectable. 13. E. The passage states that Mrs. Morland, “instead of dying in bringing the latter [Catherine] into the world, as anybody might expect . . . still lived.” The passage also mentions her good constitution — a reference to good health. 14. E. The passage elaborates on Mrs. Morland’s survival and the fact that she bore ten children and still enjoyed good health. Those details clue you in to the fact that a good constitution is robust, or strong, health. 15. E. The passage states that Catherine will do anything rather than study. 16. D. The passage makes clear that Catherine isn’t a student and her mother doesn’t make a big deal out of her daughter’s education. So if Catherine can learn a piece, it is probably a no-brainer. Choice (D) is the only option that fits this criteria. 17. A. She can’t take it anymore and gives up her lessons. Thus, she can’t stand it. 18. C. This passage’s tone is humorous exaggeration, and this line is no exception. However much you hate a teacher, you probably wouldn’t see his or her dismissal as one of the happiest days of your life. 19. B. The passage mentions French, as well as account (math), drawing, writing, and music. The other activities aren’t part of Catherine’s official education. 1. B. The area of the pizza is πr2. The radius is 6, because the diameter is 12, and the area is 36π. Dividing by eight slices gives you 4.5π. 2. A. As is the case with several math questions on the SAT, the best strategy here is to plug the answer choices into the equation given in the question. Lucky for you, the first answer, Choice (A), works in the equation, so you can stop right there. If you’d rather do algebra to solve this problem, though, start by distributing the 2, to get 2x + 8 = 6. Subtracting 8 from both sides gives you 2x = –2, and x = –1. The final answer, 1.5625, is the same as 19⁄16. 4. D. First off, you must realize that the set contains 21 numbers, not 20. Remember that to find the size of a list of numbers, you subtract the first and last numbers and then add one. (Count them if you don’t believe me.) Now, the even numbers are 20, 22, . . . up to 40, which makes five numbers in the 20s, five in the 30s, and 40, which makes 11 numbers out of 21. 5. E. All the numbers have three digits. Only Choices (A), (D), and (E) have a units (ones) digit that equals the sum of the other two digits. And, using a calculator, you can see that the square roots of 156 and 516 are decimals, while the square root of 729 is 27, which makes it your answer. 6. D. A slope of –1⁄3 means that the line goes down 1 space every time it moves 3 spaces to the right. Because point M is on the x-axis, the line has gone down 2 spaces by the time it reaches M, so it must have moved 6 spaces to the right. In other words, point M is at (5, 0). Point M is the midpoint of the line, which means that it’s halfway to point P. So to get to point P, you need to move another 2 spaces down and 6 spaces right, which puts you at (11, –2). 7. C. Because b + c = x, b = x – c. So you can substitute (x – c) for b in the first equation, and write a(x – c) = n. Because of the parentheses, you have to use the distributive law to get ax – ac = n, which is Choice (C). 8. D. Possible numbers for g are numbers like 3, 6, 12, 15, 21, and so on. If you try multiplying these numbers by 7 and then dividing by 9, you discover that the remainder is always 3 or 6. Because 3 isn’t one of your choices, 6 is the right answer. 9. D. A lot of these answers look true. However, if you let a equal 1, or a number less than 1, you realize that most of them become false. This question is an old SAT trap; numbers between zero and one (such as fractions) behave in funny ways. The only statement that is true for all positive numbers is Choice (D): Twice any positive number must be bigger than the original number. the length of AC: . Cross-multiplying your ratio tells you that 18(AC) = 288, and AC = 16. Now, because , triangle ABG is similar to ACF, as well. And because AG = GF, the line GB cuts triangle ACF in half, which means that AB is half the length of AC, or 8. Be very careful that you match up the right parts when you write a ratio. Otherwise, you’ll undoubtedly get the wrong answer. For example, if you matched line AC with line CE in the ratio for Question 10 by accident, you’d get the incorrect answer. 11. B. By adding the two expressions, you discover that 4a + 4b = 20, so a + b = 5. You can also solve for the variables to get a = –2 and b = 7, which gives you the same answer. 12. B. Ah, yes, an SAT classic. Every time a wheel rotates, it covers the equivalent of one circumference of distance. The circumference equals 2πr, but you have to be careful about units. The wheel has a radius of 18 inches, but your answer needs to be in feet. The circumference is 2× 18 × π inches = 36π inches = 3π feet = about 9.4248 feet. Therefore, 50 revolutions covers 50 × 9.4248 = 471 feet. 13. 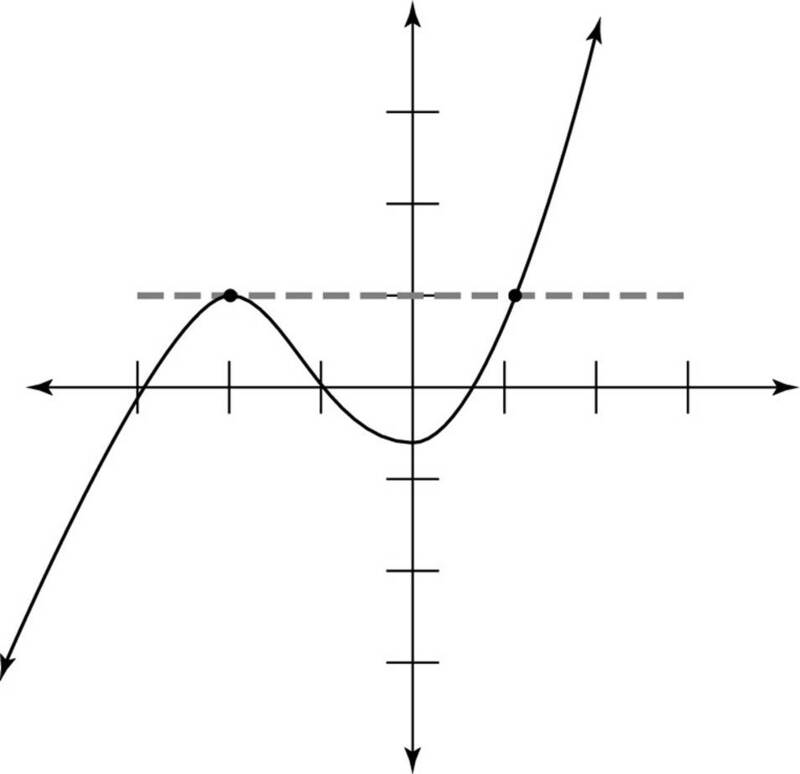 C. This problem involves exponent laws: When you take a power of a power, such as , you multiply the powers. So this expression equals 5p(q + 1) = 5pq + p. Also, when you multiply exponents, you add the powers, so . 14. C. Take each statement one at a time. Choice (A) is true. The mode appears most often, which means the set has to have two, three, or four 90s. Choice (B) requires you to remember this formula: Total = Number × Mean. In this case, the five numbers must add up to 5 × 80 = 400. Because you know the set has at least two 90s, which add up to 180, the other three numbers must add up to 220. But because the numbers are all positive, you wouldn’t have enough room for the last two numbers if 240 were in the set, which makes Choice (B) true. Choice (C) is false because making a list whose average is 80 without including any 80s in the list is easy. Try it yourself and see. You could, of course, stop there (and you probably should, to save time, on the real test). But I want you to give you your money’s worth, so I continue through the rest of the answer choices. Choice (D) is definitely true; you used this fact already when you checked Choice (A). In Choice (E), the median of an odd number of numbers is the middle number. So if the median were greater than 90, then three of the five numbers would have to be greater than 90. But you already know from Choice (A) that the set must include at least two 90s. You can’t have a list with two 90s and three numbers greater than 90 and still have the average be 80. Thus, the median can’t be greater than 90. 15. 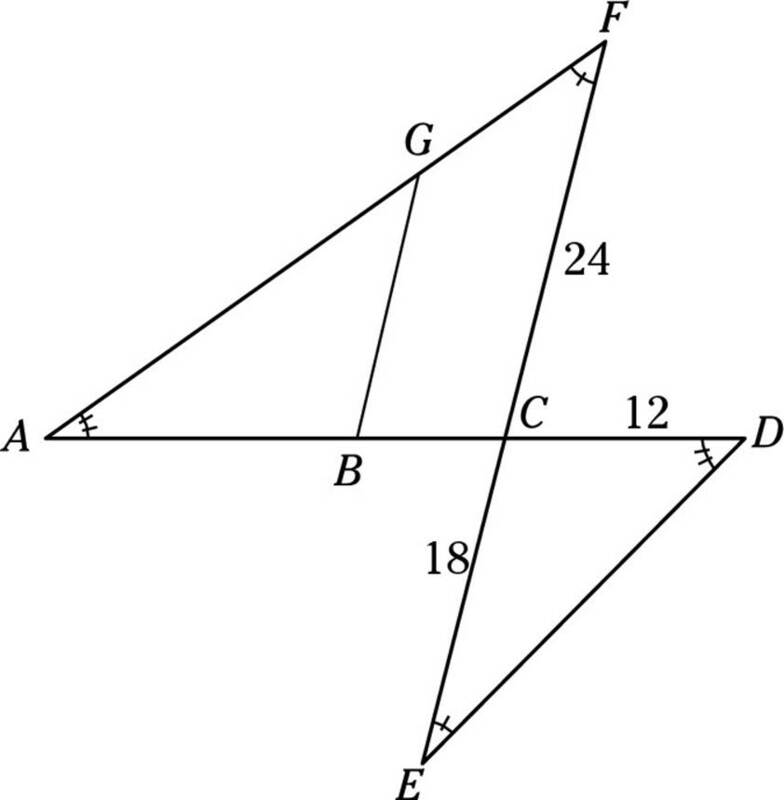 E. Because triangle BCF is isosceles, BC = CF = 8. Because angle D is a right angle, triangle DEF is the world-famous 3-4-5 right triangle, and DF = 4. Because DC = 4 + 8 = 12, AB is also 12. And, because AD = BC = 8, AE = 8 – 3 = 5. Now you’re ready to find EB, the hypotenuse of the right triangle ABE. You can, of course, use the Pythagorean Theorem, but you’ll save time if you realize that you’re face to face with a 5-12-13 right triangle, and BE = 13. 16. A. Call the room shared by Melvin, Carey, and Dan room X, and the other room Y. Because Mike and Melvin won’t live together, Mike must be in room Y. Now, if Dave and Dan live together, Peter will live with them, but you can’t fit two more people into room X, so Dave and Dan must live apart, which puts Dave in room Y also. Similarly, because Enoch will live with Chris or Carey, Chris can’t be in room X either, which puts Chris, Dave, and Mike in room Y. 1. C. Connecting words (conjunctions, in grammar lingo) add meaning to the sentence. Using your reading comprehension skills, you know that you’re looking for a cause-and-effect relationship between the two parts of the sentence, so you can rule out Choices (D) and (E) right away (the words and and with don’t give you a cause-and-effect relationship). Then consider concise, economical wording, and Choice (C) pops to the top. 2. A. One rule to keep in mind is that simplest is often best, at least when it comes to written expression. Every choice except Choice (A) adds unnecessary words, and Choice (E) goes further into no-no land by creating a comma splice; two complete sentences shouldn’t be linked only by a comma. For this question, stick with the original! 3. C. If historians are debating, you already know that the topic is controversial (in dispute), so you can lop off the end of the original sentence. Choice (C) is the only answer that does the job (explaining why Cleopatra’s role is controversial) without extra words. 4. D. This question tests your knowledge of pronouns. One is a pronoun, so it must refer to a particular noun or pronoun. In the original sentence, the most logical meaning of one is “lawyer,” but lawyer doesn’t appear in the sentence. Only Choice (D) contains the word lawyer, so you know it’s the right answer. 5. E. The original sentence leaves you hanging because it doesn’t complete the thought. (Read it aloud and you’ll hear that something’s missing.) You need a verb to pair with the subject Manet. Choices (C), (D), and (E) all supply verbs, so any of them could be right at this point. Looking at these choices more closely, you can see that Choice (C) isn’t right because was identifying implies an ongoing situation, as in “Manet was identifying while something else happened.” Choice (D) is wrong because had places one action before another, and the sentence doesn’t justify that sort of timeline. Choice (E) supplies a plain old, past-tense verb, which is just what you need here. 6. B. The original sentence tacks on an extra idea — “and they didn’t like them.” Your task is to tuck that idea into the sentence more neatly, which you can accomplish with Choice (B). Choice (C) may draw your eye because it’s short and sweet, and conciseness is often an advantage in this sort of question. However, the sentence begins with for, so you’re looking at something that was for the banks. They doesn’t pair well with for the banks. What you’re looking for is the idea that salary caps were unlikable for the banks. Choice (B) supplies that meaning. 7. C. You can’t glue two sentences together with a comma. Well, you can, but then you have to go to Grammar Jail. Choice (C) adds a semicolon, which links the ideas legally. 8. B. The subject/verb pair in this sentence is viruses activate. In between this pair is a little extra information — what happens to activate the body’s defenses (the viruses enter the body). Choice (B) is the best answer because it’s in present-perfect tense, a tense that ties the present (activate the immune system) with the past (when the viruses entered). 9. A. Organizing is a gerund, which is a fancy English-teacher term for the –ing form of a verb that acts like a noun. But you don’t need special grammar vocabulary to crack this sentence. The superintendent doesn’t object to us, as Choice (B) states. He objects to the organizing of a dangerous club. The possessive pronoun our points the reader toward the key word organizing. 10. D. If you’re rebelling, you go against, not toward the government. The other choices add unnecessary words. 11. E. In a sentence, one verb’s tense should match another’s, unless you have a good reason to change tenses. Carved is past tense, and Choice (E) matches that tense with decorated. The sentence would also make sense with a present-tense verb (the ancestors carved long ago and Ella decorates now), but decorates isn’t an option. 12. E. The introductory phrase (Sent . . . age) has to describe the subject of the sentence. The curriculum wasn’t sent to boarding school; Sandra was. So you have to find an option that makes Sandra the subject; you can narrow down the answer to Choices (D) and (E). No ongoing action justifies Choice (D), so Choice (E) rules. 13. D. Whatever elements of the sentence the conjunction and links must have the same grammatical identity. By his heroism is a prepositional phrase, but “that he was always motivated by patriotism” has a subject/verb pair. (In case you’re desperate to know, a subject/verb pair creates a clause.) Even without the official grammar terms, you can hear that the original sentence is unbalanced. Choice (D) restores equilibrium to the sentence and is the right answer. 14. B. I hear “equally as” all over the place these days, but sadly, it isn’t correct English. Dump the as and you’re all set.